At the surfari you will equipped with transportation and a personal guide, you will surf a diferent point break everyday, or do something different if you want! In our Surfaris and Surf Tours you will enjoy among unlimited transportation and to surf different pointbreaks during the days, and we also have tours available during the night. At the morning you could explore the area and search for perfect surf spots, to surf with the right conditions and during the afternoon you could surf again depending on your mood and swell condition, if the waves are not with the right shape you will be able to try other sort of activities. For a lot of people, Punta Mango makes their El Salvador experience. 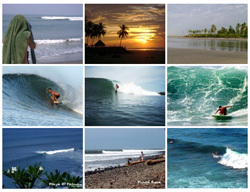 This is the wave that international travelers come to El Salvador for, this is the one you've dreamt about. Punta Mango is where you're most likely to get the cover phot barrel shot of you life. And because Punta Mango is only accessible by boat and is surrounded by tropical forest, the whole expererience ends up feeling like you are in your own private wersion of "quiksiver crossing". Punta Mango needs a good swell to really go off, but from four feet up it can serve up consistent tubes that will make you seriously consider never going home, and from six feet upward it is epic. Among the different activities there is a visit to the volcano chain in the department of Sonsonate which is one hour and a half a way in car, and hidden in a valley of volcanoes, lakes and lagoons you will find the Cerro Verde National Park. This is an ecologic park located between two volcanoes; the two of them are very different from each other; first there is the highest volcano of El Salvador, the Volcan of Santa Ana, also know for being in activity during the last years; and then, half an hour a way, there is the Volcan de Izalco, also know as The Light of Central America for being in heavy activity forty years ago. In this ecologic complex you could take long walks between natural footpaths, watch some exotic flowers and also have a unique view of the volcanoes. In the department of Sonsonate there is the impressive “Ruta Las Flores” Tour, this tour takes approximately 6 hours because you get to visit a group of inspiring colonial towns up in the mountains, hidden between coffee fields there are the towns of Ataco, Juayua and Apaneca; all little and colourful time stopped towns that allows you to appreciate the Spanish Architectonic Style like back in the Spanish Conquer. Among the diversity of activities you could enjoy the Gastronomic Fair that is always programmed by the community of Juayua, besides there are long walks to lagoons and waterfalls. Horseback riding, biking and hiking are another choice too. A couple of hours away from the coast, in the department of Cuscatlan rest Suchitoto, a little town which is the most traditional town of El Salvador, culturally speaking. Suchitoto’s main activity is tourism, its rocky streets around the City Church make of it a beautiful place to remember; among the alternative activities there is a boat ride through the Suchitlan’s Lagoon where you could appreciate the natural resources that are near town; also you could visit the Local Gallery where you would find paintings of the local artists, and try to understand their unique art. El Salvador was influenced by the Mayan Culture; there are different archaeological structures that are compared to the ones in the Peninsula of Yucatan in Mexico, Guatemala and Honduras. Our team has prepared an archaeological route so our guests can enjoy and meet the history of different civilizations. You could meet Joya de Ceren; this magical place is an archaeological site where you could get to understand the life style of our ancestors. Also there is a visit to the Ceremonial Centres in San Andres and Tazumal. If you wish to have an adrenaline rush, there is the Canopi Tour which is located a few minutes away from the coast of La Libertad. Enjoy sliding from the top of the trees inside a tropical jungle in the Pacific Coast of Central America. An hour away from La Libertad we locate a huge rock called: The Devil’s Door!, La Puerta del Diablo, there you could drink the traditional Atol de Elote which is crushed corn with milk. In the same area there is the Thilo Deninger National Park, and the infamous “pupusas” in Planes de Renderos Park. Our traditional meal is corn tortilla mix with rice or beans, cheese and pig meat. If you just love the water activities our team will help you to hook you up with the rafting team in the Lempa River. Our team will get you to dive in the Lake of Coatepeque; all you need is to bring your licence with you. If you want to hang out in the City of San Salvador, our guides will take to the best bars, clubs and restaurants; or what ever that’s of your interest like museums, art galleries or malls. San Salvador offers all kinds of options to enjoy and to know, and the best of it it’s that is only 20 minutes away from the Coast of La Libertad. As you can see our Surfaris are not all about surf, but you would have different options to have a lot of fun in your staying. If you wish to surf only you will have the chance to surf in right place at the right time with the best surfing conditions. The idea is that you make your own time and you decide what to do and our team will aid you with the information you might need. The prices include: airport transfers, two daily surf tours, two alternative tours to volcanoes, lakes, colonial towns, mayan ruins or the city of San Salvador, a boat tour to Punta Mango and one night accommodation in camping area in Las Flores beach. full time guide service, and full time car availability.